“Quality care at an affordable price” I treat patients as if they are family in a friendly, professional environment. I strive to make chiropractic care accessible to everyone. With almost 20 years experience, my fees are still less than the typical insurance co-pay, and far less than what the average chiropractor charges. My fees are $30 for an adjustment and $40 for an adjustment and therapy. Chiropractors have been trained to detect and correct postural, muscular, and skeletal abnormalities that lead to pain, disability, and decreased health. After a brief history and exam, your condition will be explained, and your questions answered. Based upon the exam findings, recommendations will be made to correct any problem. Treatment will include an adjustment (if indicated), to correct any subluxations. Physiotherapy, such as interferential current, moist heat, ultrasound, or massage may also be applied. Home care, such as stretching and/or specific strengthening exercises, when appropriate, will also be recommended to increase long term benefit. A subluxation is minor “mis-alignment” of the bones of the spine. Tight muscles, decreased range of motion, pain and stiffness are common signs and symptoms that a joint is not functioning properly. This mal-function can lead to dehydration of the disc and joints which can lead to conditions such as osteoarthritis. Toxins and inflammatory products build up around the joints and can damage surrounding nerves and tissues causing pain and eventually, degeneration. Chiropractors correct the malfunction by adjusting the affected joint. Certain physiotherapies may also be used to reduce muscle spasms, pain and inflammation. He/she may also discuss stretching and exercise techniques to enhance long term benefits. An adjustment is a technique used by chiropractors to correct a subluxation. It is a scientifically researched method used to restore function to the joint and flexibility to the muscles and ligaments surrounding it. When the muscles and joints do not function properly, inflammation and toxins build up in the surrounding tissue causing cellular damage and pain. The adjustment, while improving the joints mobility also flushes out the inflammatory products which helps to restore health to the joints, muscles, ligaments and nerves. Chiropractic adjustments are no more addictive than a healthy lifestyle is “addictive”. People who exercise regularly become “addicted”, in a way, to the exercise, just as people who eat healthy tend to crave wholesome food. It is true that there are chemicals released during an adjustment. These chemicals, endorphins, are the same chemicals that are released during aerobic exercise, and while they do promote a sense of well being, or “natural high/runner’s high”, they are not addictive. Many people have heard that chiropractors always keep you coming back. While it is true that some problems require several visits, the patient will receive an honest evaluation and a reasonable treatment plan before beginning care. On average, a condition will call for 1 to 3 treatments. Once pain is diminished and range of motion is within normal limits, the patient is released from active care. A monthly adjustment is often recommended to keep the joints and muscles healthy and functioning at their best. Of course, some conditions that involve trauma, or are chronic, may require more frequent visits at first, tapering off as the condition improves. The goal is to return a patient to full, pain-free function as soon as possible, and to help them stay that way. I was in so much pain and was afraid to go to a chiropractor, but Dr. Sherri made me feel comfortable right away, and my neck felt so much better when I left her office! I am always shocked at how much better I feel after visiting Dr. Scott. Her practice isn’t just about getting rid of obvious pain, but about raising the bar for what it means to feel good. This is compassionate, quality, affordable chiropractic care at its best. A friend recommended Dr. Scott because I was complaining about low back pain. She adjusted me two times and I felt 80% better. I was a little sore at first, but she said that might happen. Now, as long as I keep doing my stretches and get my monthly adjustment, I stay pretty much pain free. I’ll admit I had never been to a chiropractor before I was referred to Dr. Sherri but I’ve had back and neck issues for many years. What a difference she made! I’ve now been going to her for about 7 years and am religious about making sure I go every 4 weeks; my body tells me when it’s about that time. I get excited for “Chiropractor Friday” every time it rolls around. I love to refer people to her because I know what a difference she has made for me and I am happy that I get to share that opportunity with others who are suffering. I’ve referred many friends and co-workers over the years and not a single person has been disappointed. Generally their response when I ask how it goes is “I LOVE Sherri!”. She’s thorough, pleasant and treats you like you matter – not like you’re just another appointment on her list. Sherri has been a blessing to me and my family. Before seeing Sherri, it was approximately eight years since the last time I visited a chiropractor. I had a bad experience with my previous chiropractor and never went back. My wife started seeing Sherri and I was noticing the benefit she received. I met with Sherri and discussed my prior experiences and asked if she would be able to do anything with me since I am 6’8” and over 500 pounds. She thoroughly explained everything she was doing and I am noticing the benefit. I have to admit I should have started seeing her sooner. I strongly recommend Sherri for chiropractic adjustments and help with all kinds of body issues. Sherri has helped me with my back and neck issues. Sometimes you just move the wrong way and you are struck with terrible pain for days. Sherri can provide the right adjustment and therapy to relieve that pain and get you back to normal, feeling better and feeling good without medication! She’s is the utmost professional and has immense knowledge about the body and chiropractic practices. I see her every month for an adjustment that keeps my alignment in balance and my body happy. One of the best things I do for myself. Being a RN for 15 years has left me with back problems. Like many of my fellow nurses, I reached a point where the pain was unbearable. I did not want to simply mask the problem with medications that wouldn’t fix my underlying injury and would make me nauseated! I heard about Dr. Scott and I am so glad I did. She worked me in the next day, her assessment was thorough and expert. She quickly identified the source of my pain and when I left her office my pain had gone from a 9 on a 0-10 scale to a 2. Thank you Dr. Scott! You have a new fan! Sherri is a god-send to me. I truly feel she gave quality back to my life by keeping me moving. I was introduced to Sherri by a referral from another parent at my daughter’s preschool. This lady walks in heels all day every day and I asked her how in the world she can do that. She said ‘because of my chiropractor. Sherri is awesome. Try her out.’ That was about one-year ago and I am thankful I did. To me, I feel Sherri is not just my chiropractor – she is somebody I respect and can call a friend. She is the type of doctor that is worth the drive to go visit. You won’t be disappointed. Best Chiropractor ever!!! I highly recommend Dr.Scott. My son and I have both utilized her services. She does an amazing job of providing care and getting you pain free. We both love going there because once you leave her office all your aches and pains are gone. 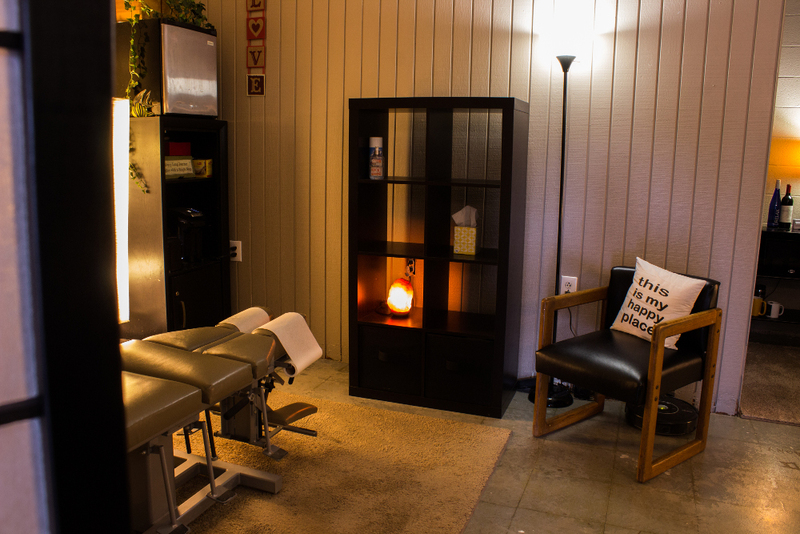 Her practice is a welcoming and relaxing environment. She customizes her care to fit each person’s needs and she works well with adults or children. Dr. Sherri Scott is awesome! She has helped me and many of my family and friends with shoulder, elbow, neck, and back pain. I always feel better after having a treatment from her. Dr. Sherri Scott has been my chiropractor for years and I would refer to anyone to her. Her prices are reasonable and she is very caring and her treatments are very effective. Dr. Sherri has been treating patients as if they are family for almost 20 years. Conveniently located in Kansas City, KS, her office is easily accessible from Roeland Park, Merriam, Shawnee, Lenexa, Overland Park, Kansas City, KS, and Kansas City, MO. I treat patients as if they are family in a friendly, professional environment. I strive to make chiropractic care accessible to everyone. With almost 20 years experience, my fees are still less than the typical insurance co-pay, and far less than what the average chiropractor charges. My fees are $30 for an adjustment and $40 for an adjustment and therapy.